This post takes a look at lobe 3 of the Fan. 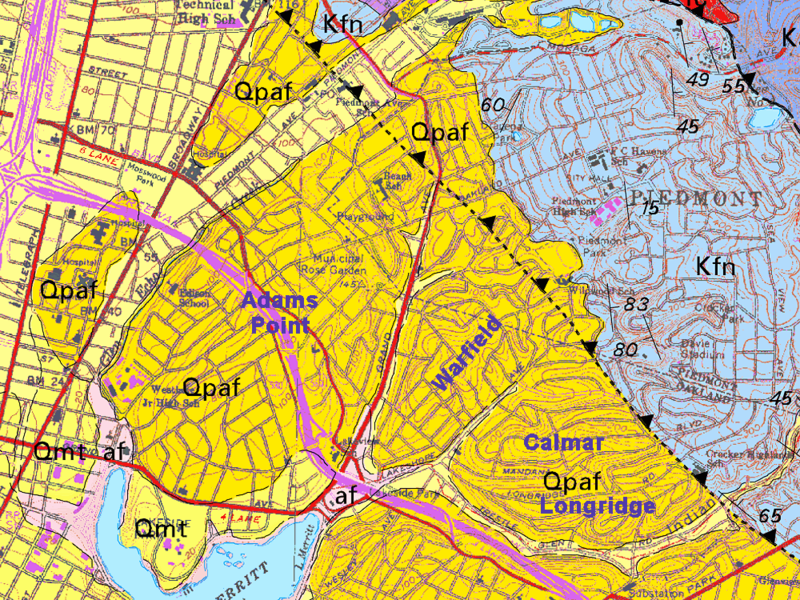 To orient you as we start, here’s where lobe 3 fits in the bigger picture on the geologic map. This is the best time of year to walk around the Fan, in the Oakland midlands. 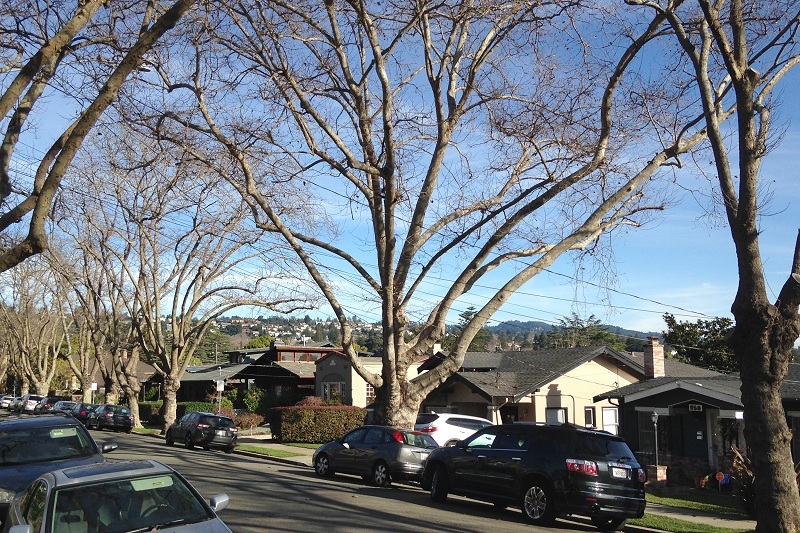 When the trees are bare you can see farther and better — the landscape’s bones stand out, and the homes do too. So get yourself on out! This lobe is more difficult to explore than the others. 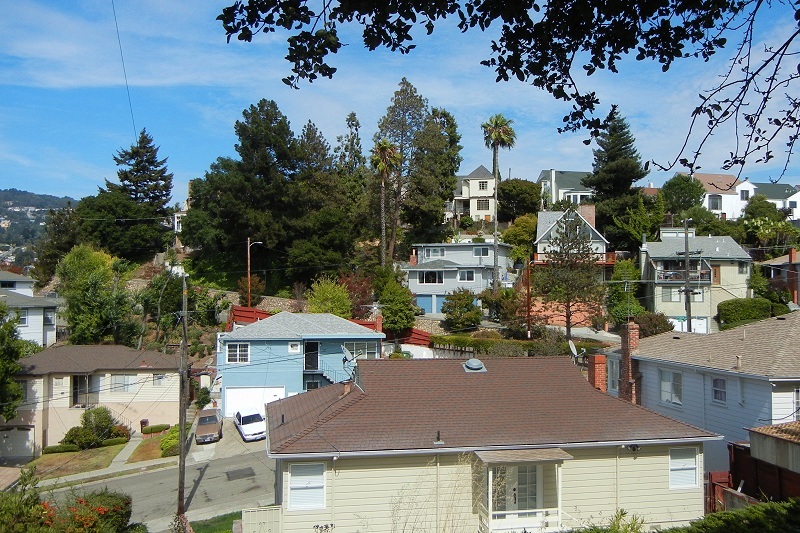 One problem is that the trees are larger and the landscaping thicker, which makes it hard to get a good view around you. 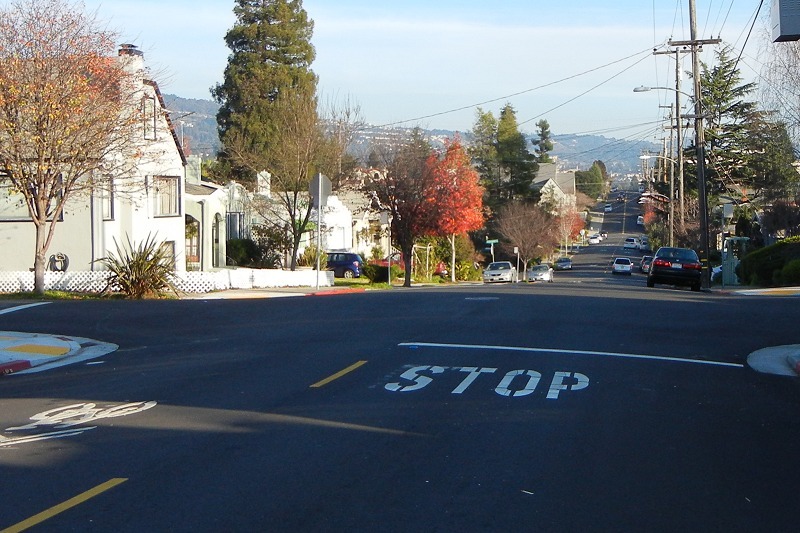 Another is that the streets are laid out in a distributary fashion — that is, you aren’t expected to drive through it except in a couple of places. 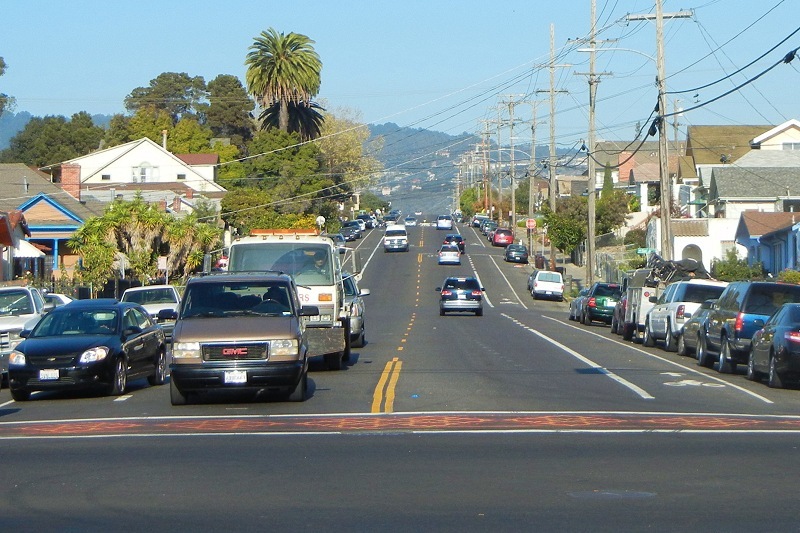 You’re supposed to drive into it, to your single-family home or small apartment building, and out of it, to work or shop. So getting around in any other direction is not straightforward. 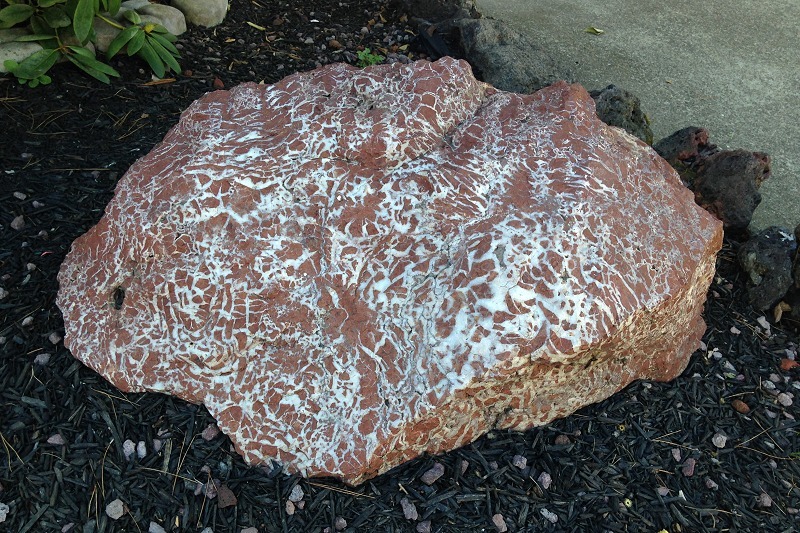 Maybe this will be clearer on the geologic map. For convenience, I’ve divided the lobe into four sublobes. I tend to analyze landforms from their ridgetops and divides and saddles, features on top of the land. 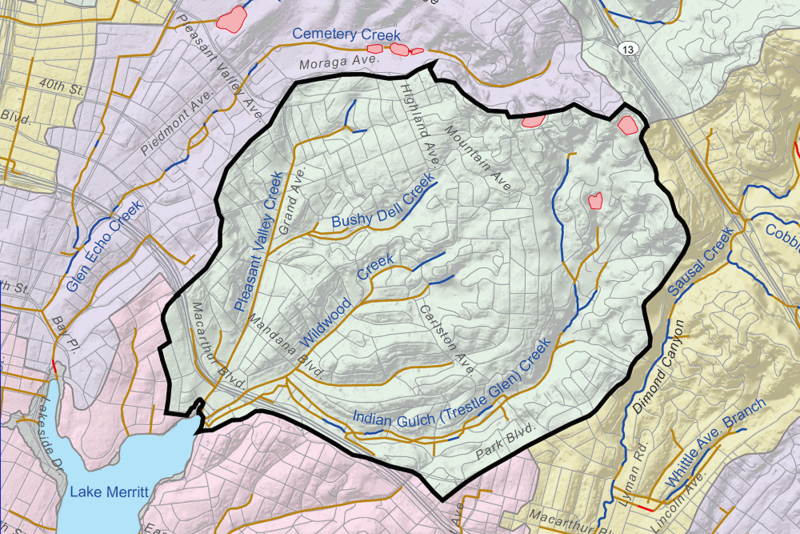 But lobe 3 may be easier to comprehend as a set of stream valleys dissecting a highland, as shown in this watershed map from the county flood control district. As with the other parts of the Fan, the edges of lobe 3 are pretty clear-cut. 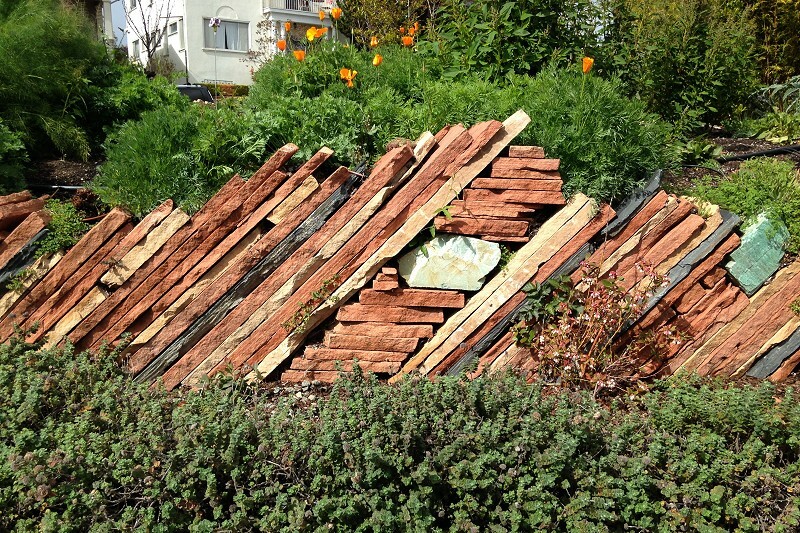 This is typical of eroded landscapes in arid country, which is interesting because Oakland isn’t especially arid these days. It was during glacial times, though. 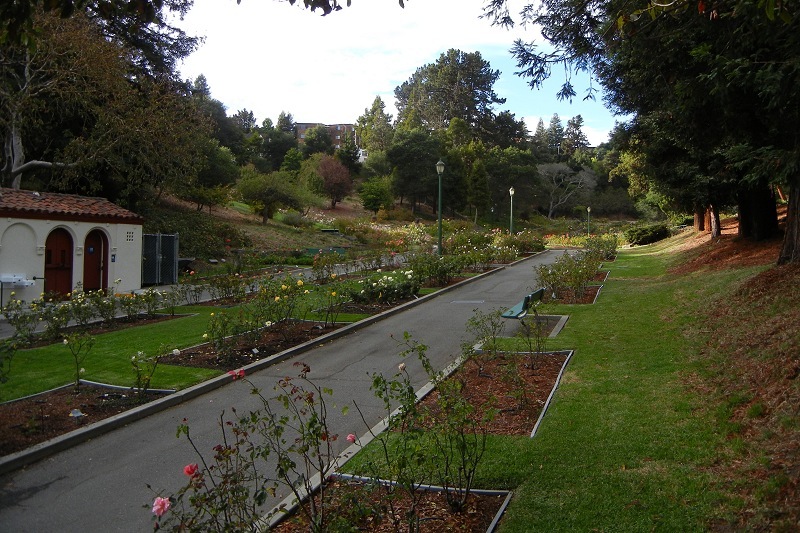 Here’s the north edge at the south end of Ramona Avenue, just west of Mountain View Cemetery in the valley of Glen Echo Creek. 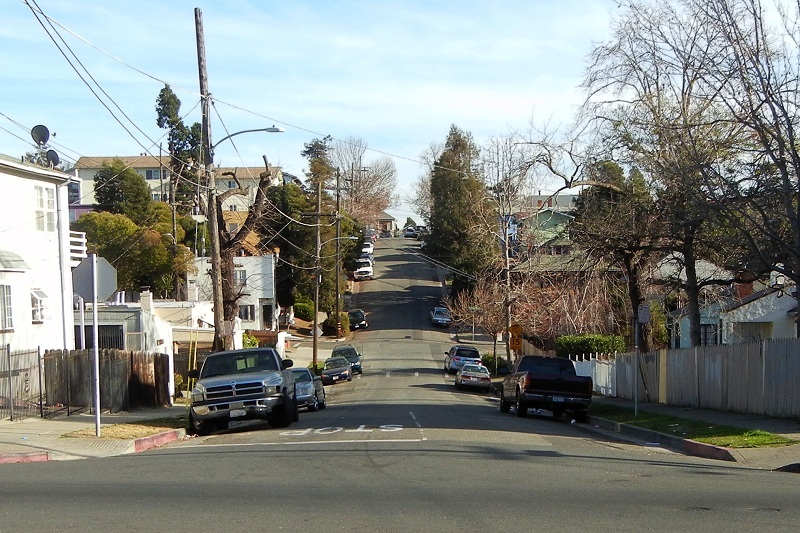 This view across the Glen Echo Creek valley up Monte Vista Avenue gives a better idea of the height of this lobe — about 80 feet here, but it seems like much more. 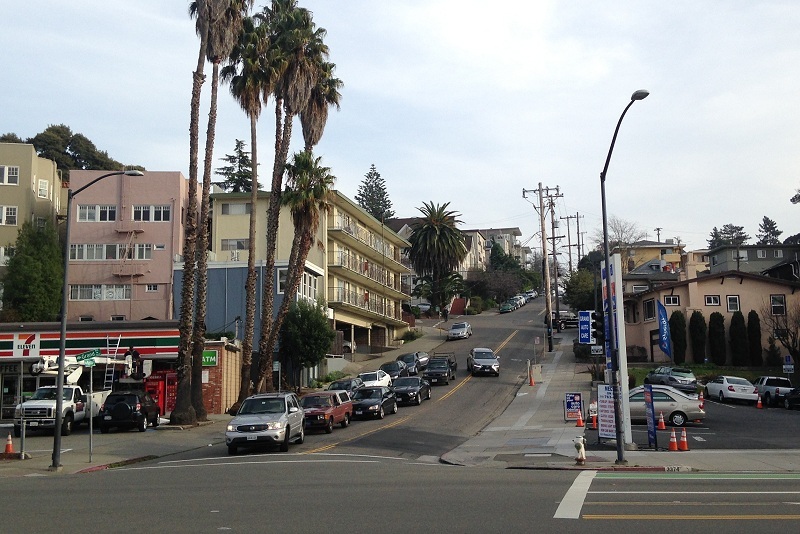 At its westernmost edge, the lobe starts right where the Whole Foods store stands. Everything in front of the far hills is part of the Fan. 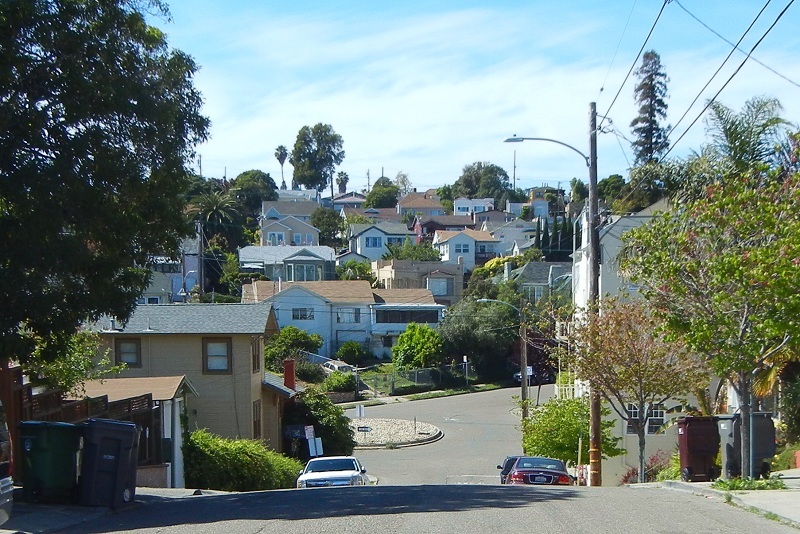 This shot from the toe of the Calmar sublobe shows why the Fan has always been land to make homebuilders salivate: fantastic views of the city, the Bay and the Golden Gate. Adams Point fills the middle ground. 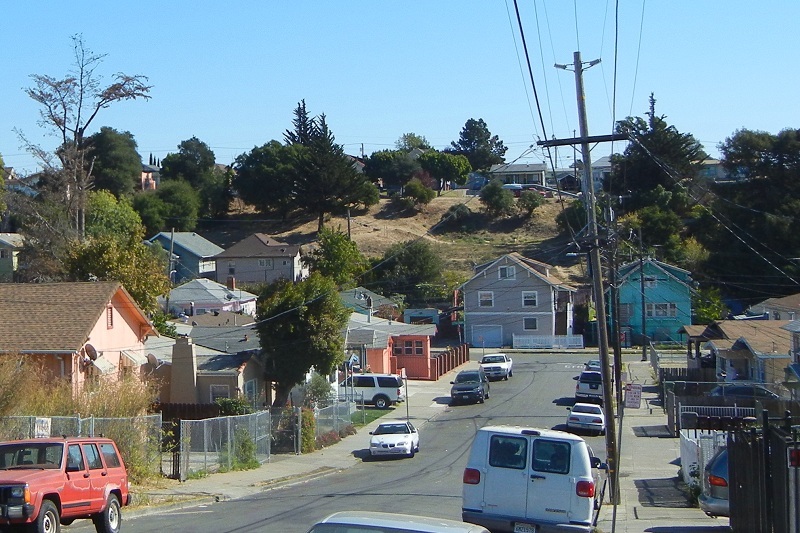 And here’s a final view across the edge of the lobe, this time as seen from the freeway overpass over the homes in Trestle Glen. Longridge Road along the top gives its name to this sublobe. The Adams Point sublobe is larger, but a little lower than the others, reaching about 160 feet elevation. 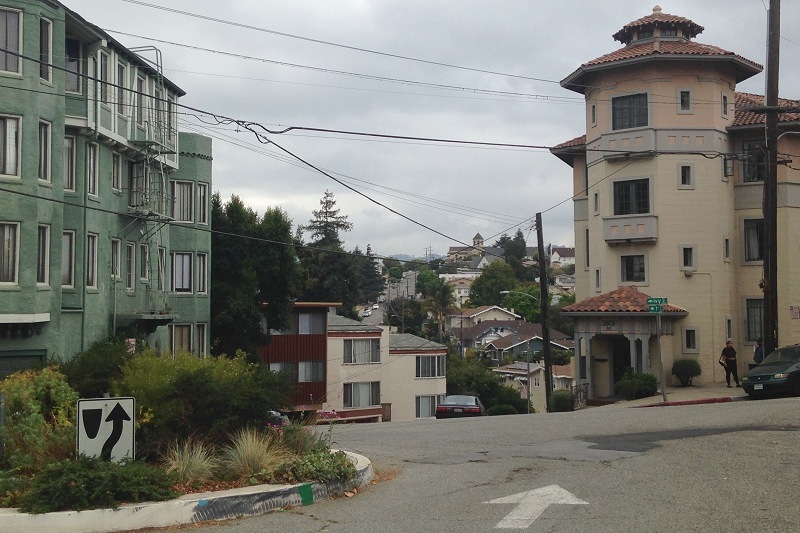 Its highest ridge, along Fairmount, Kingston and Rose Streets, offers good views north toward lobe 2. 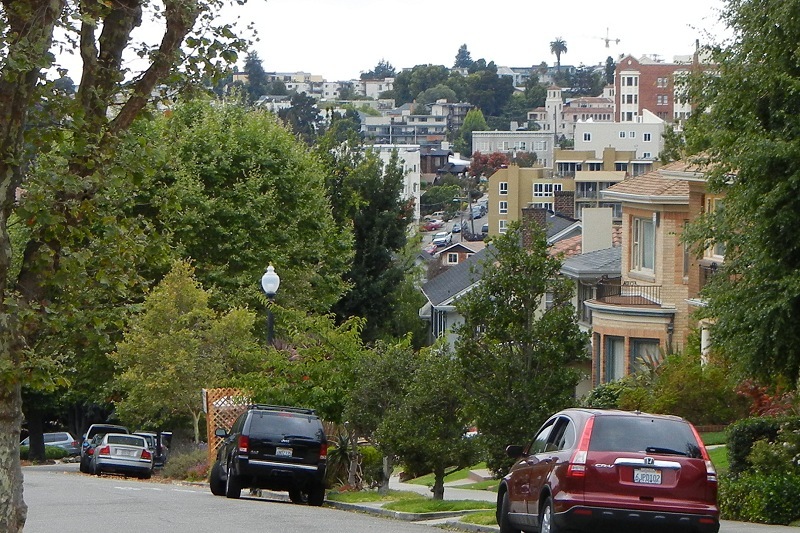 Points on the other side, like Jean Street and the knob of Nace Avenue, overlook nice vistas south and east. Or Cambridge Avenue. 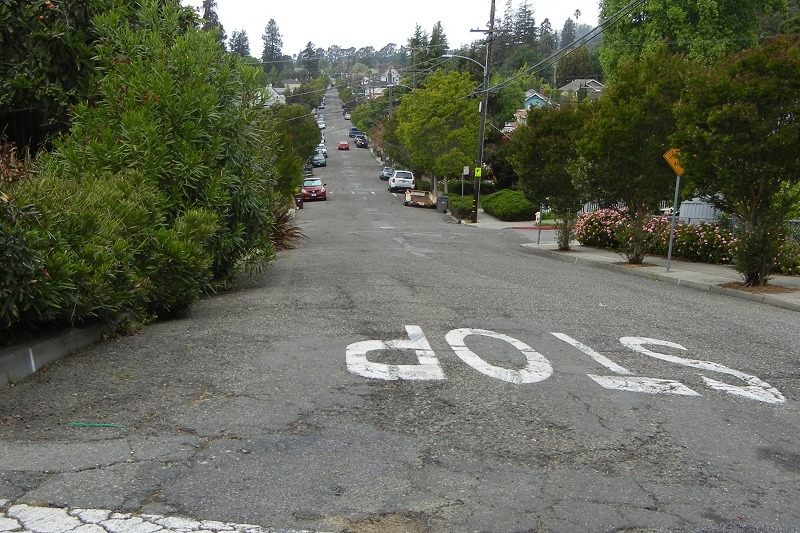 or go up the Bushy Dell Creek valley on Wildwood Avenue and over to Winsor Avenue. In between it’s a bit intimidating, as seen from the foot of Jean Street. 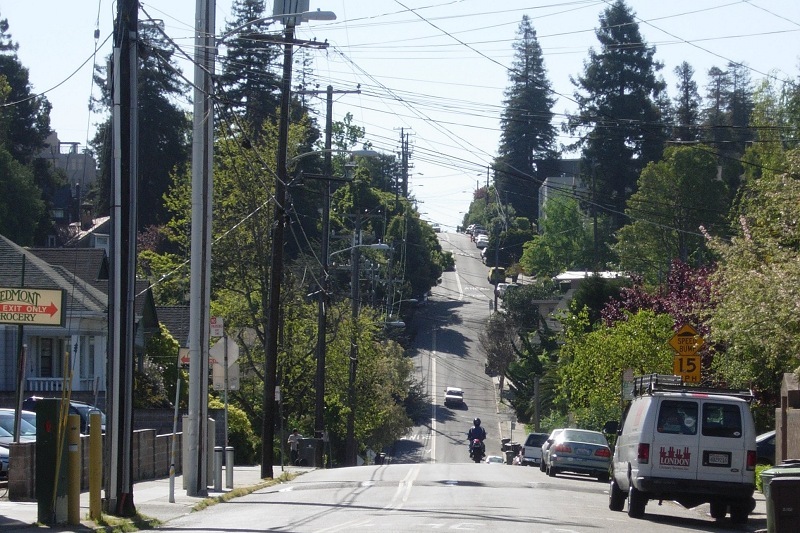 The Calmar and Longridge sublobes are the highest, reaching well over 200 feet elevation at their upper ends. Longridge is particularly hard on landscape photographers because there are so many mature trees and big homes. 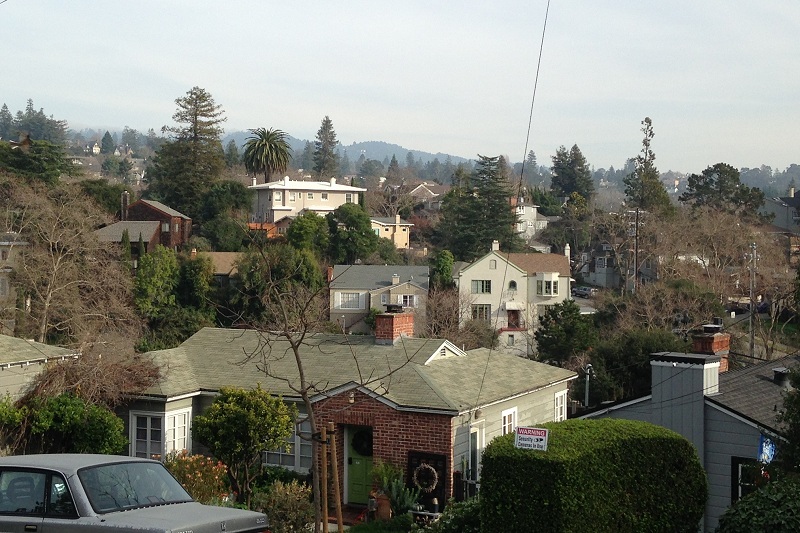 (If only it were 100 years ago, when this whole tract was bare hills.) But I like this shot from Long Ridge. 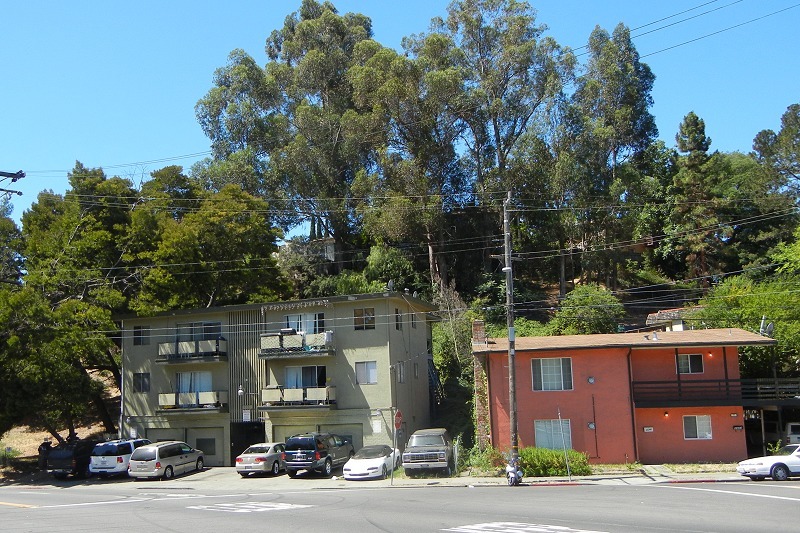 On the right edge it shows the red-brick Grandview Apartments building (Warfield sublobe), the Spanish Revival apartment complex on Crescent Street (Adams Point sublobe), and behind them the big palm tree at the top of MacArthur by the Chetwood overcrossing. 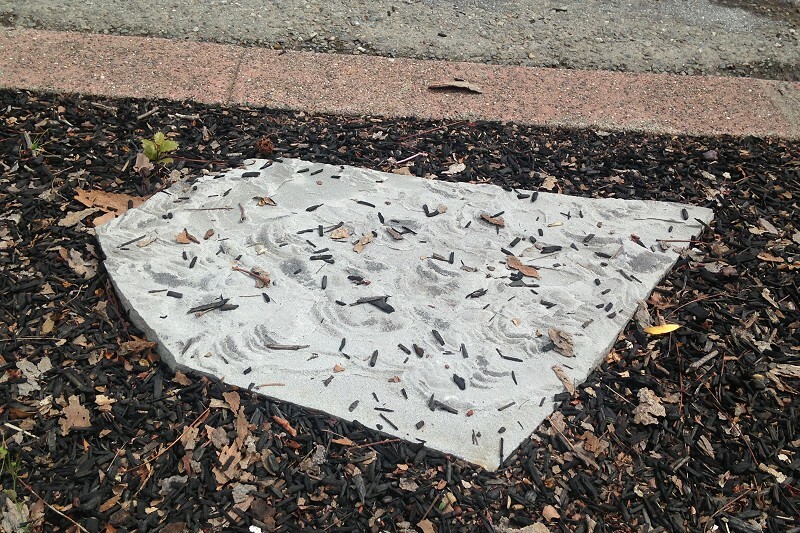 A little bit of Elwood Street is visible to their left. But if finding big views is frustrating, it’s easy to find cute little pocket valleys all over lobe 3. 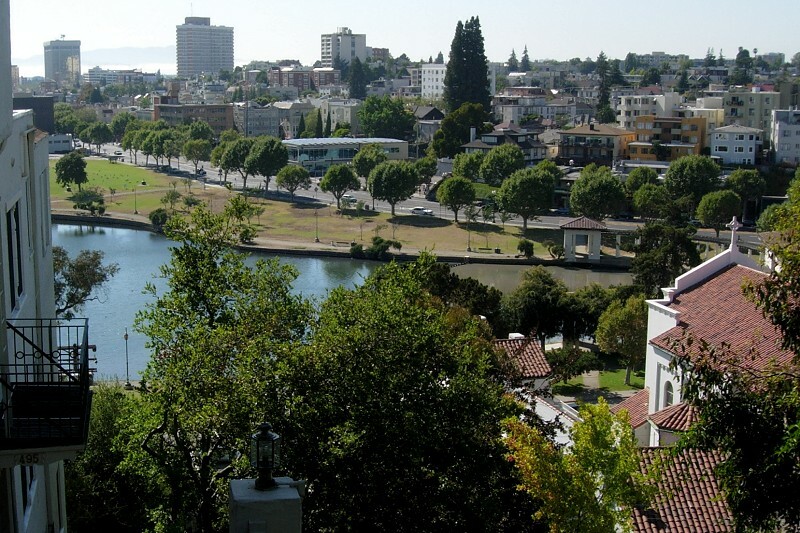 The only one I’ll point to here is the one with the Morcom Rose Garden in it. Here’s where all twelve photos were taken. 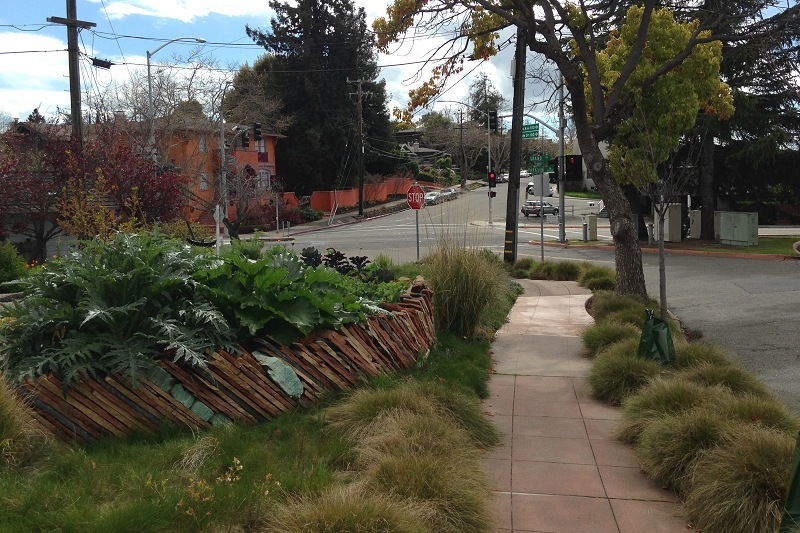 The ancient alluvial fan of central Oakland consists of eight lobes. 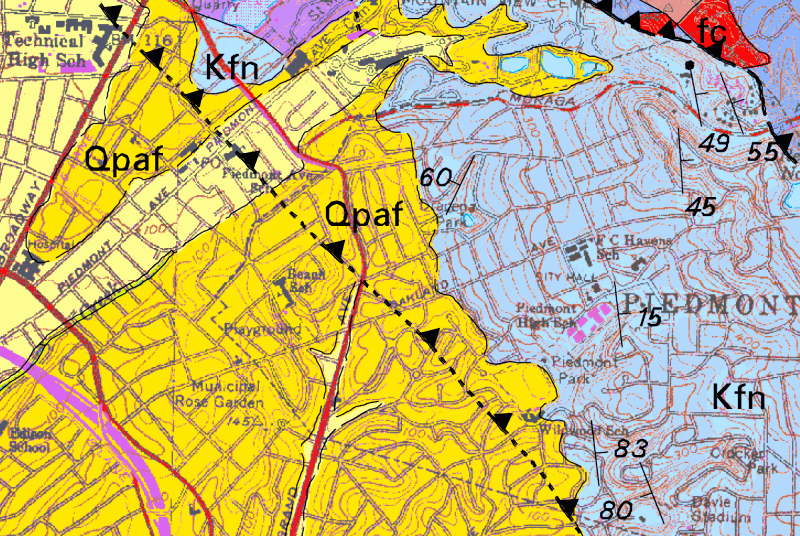 To refresh your memory since the tour of Lobe 4, here they are labeled on the geologic map. This week I want to show you Lobe 6. 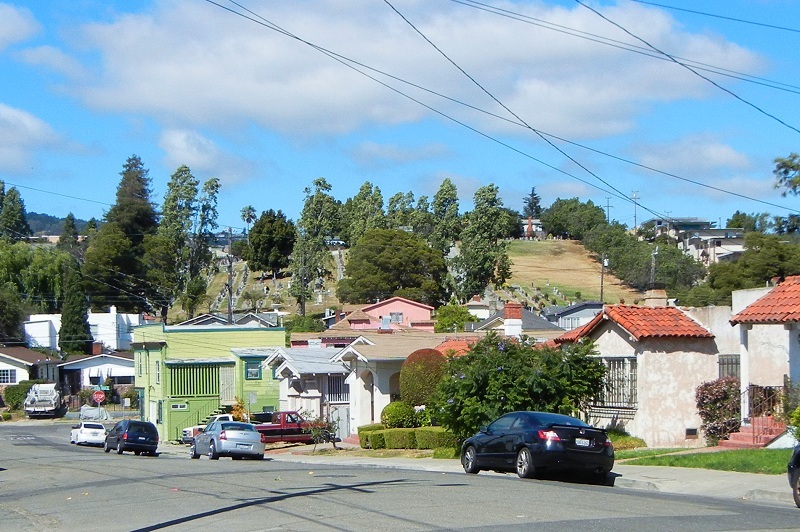 The dominant feature of this lobe is the hill on which the Maxwell Park neighborhood was developed nearly a century ago, but the hills has lesser rises around it defined by stream valleys and a freeway. I’ve named these divisions for convenience as follows. 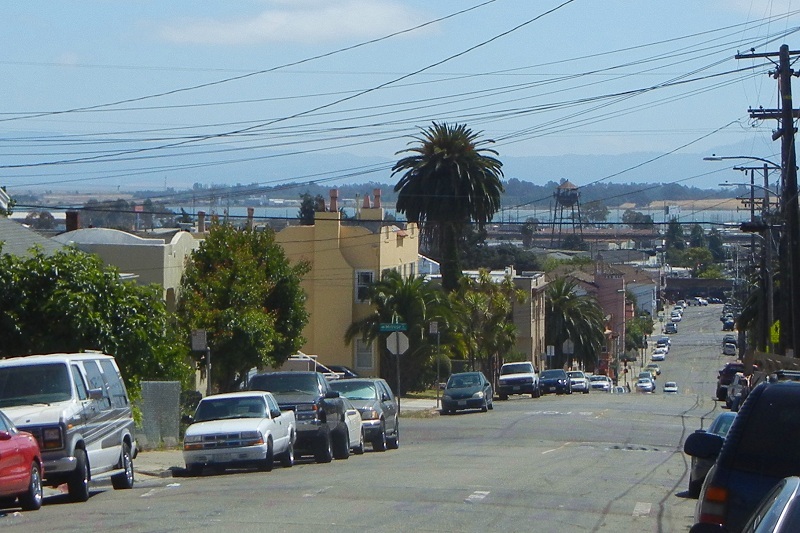 And looking down 47th Avenue past Melrose Street toward the bay. 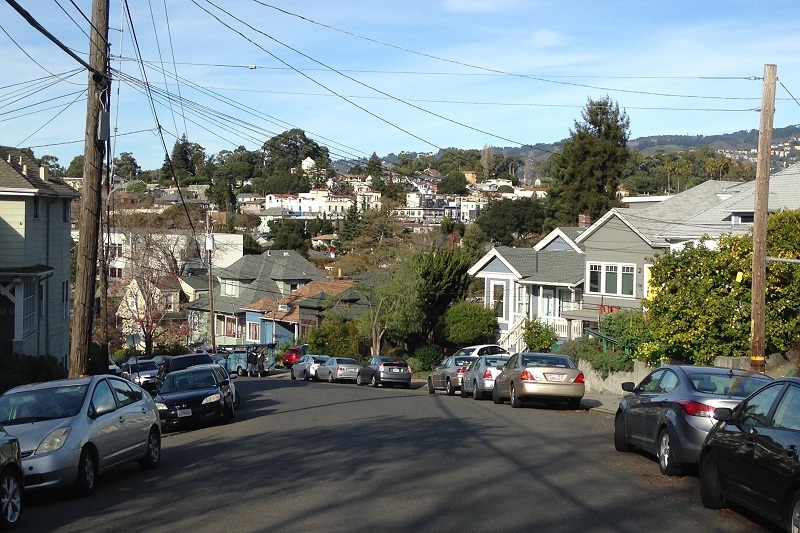 Looking down Trask Street from Cole Street. 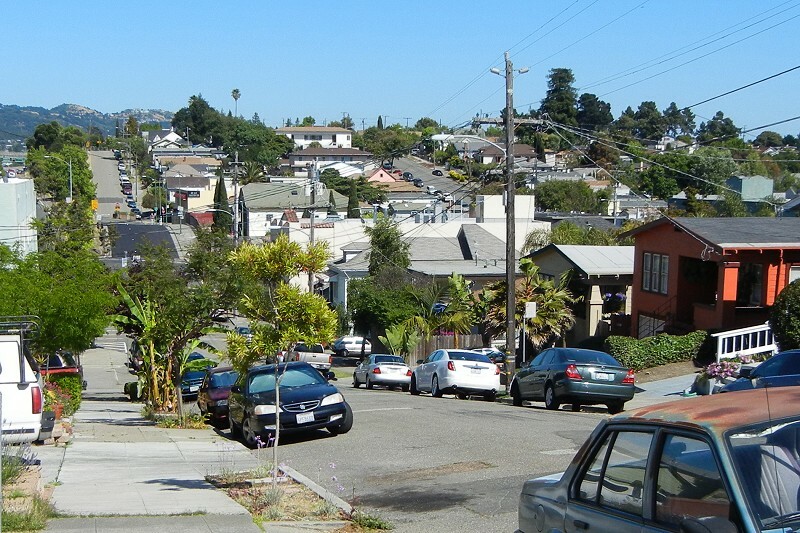 That’s the Bay-O-Vista hillside neighborhood of San Leandro left of center in the back, and the hills above Hayward in the back center. 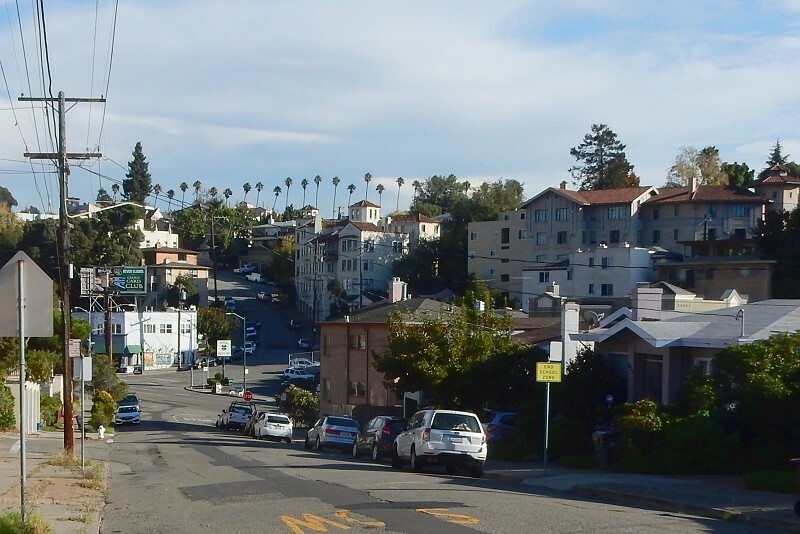 And looking down Camden Street from Madera Avenue onto MacArthur, with the trees of Mills College in the back left. The higher, eastern end of the lobe is not as well defined except on its north side, shown here looking from High Street onto Bayo Street. The other edges of the lobe are quite a bit more rugged. This is the north side of the Jefferson segment, seen from Gray Street. Just to the left of this frame is the landslide scar of Jungle Hill, which I featured in my post about peculiar Harrington Ridge. 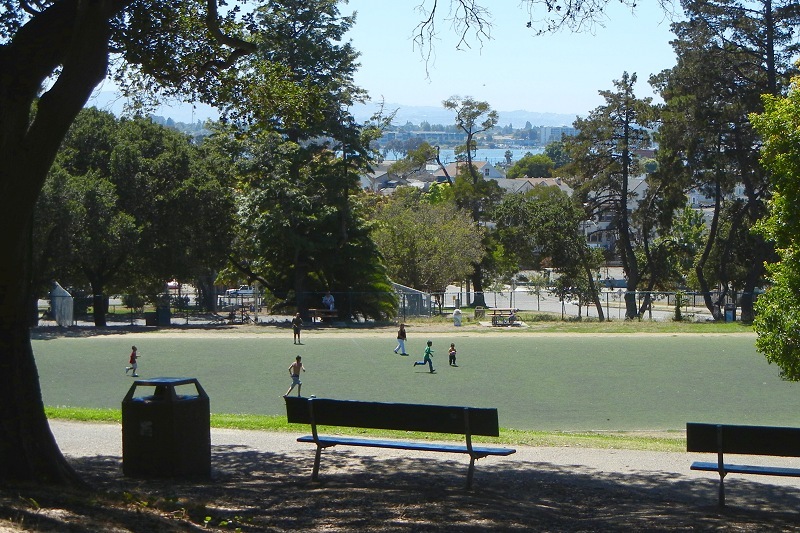 Brookdale Park on High Street, where the Jefferson and Maxwell segments meet, offers a rare glimpse at what the Fan is made of: ancient, well-compacted clay and sand with some gravel here and there. The Maxwell segment dominates Lobe 6 in height and area. 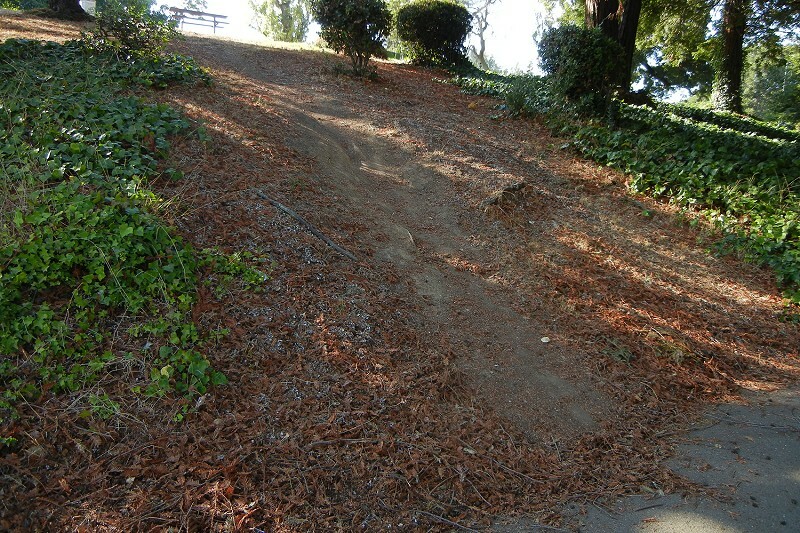 Its steep northern and eastern faces were shaped by stream erosion from below. 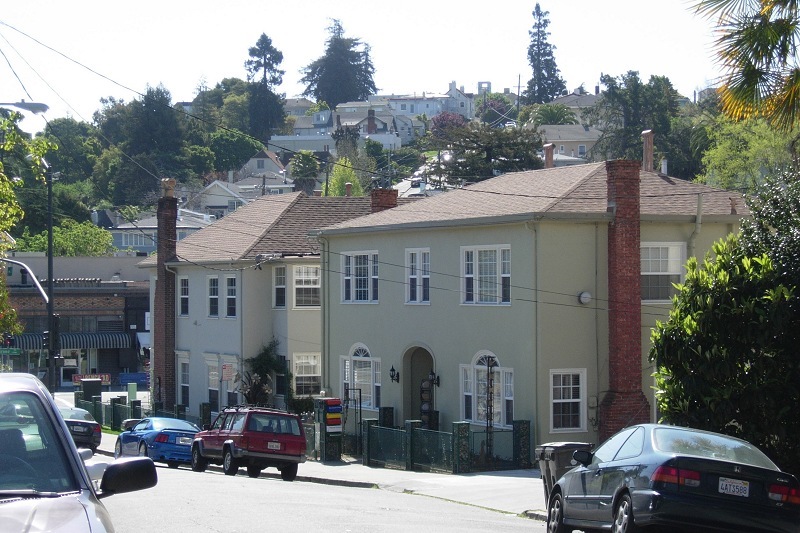 Here, on MacArthur just south of I-580, it may have been steepened further by development-related excavations. Seen from across the freeway on Green Acre Road, near the top of the St. Lawrence segment, the spine of Maxwell Hill, about 260 feet high, walls off views of the bay. The dip in the foreground is one of many gulches that punctuate the lobe’s rim. Lobe 6 is nearly severed in two places. One is where the freeway punches through, having enlarged a pre-existing saddle between the Maxwell and St. Lawrence segments. 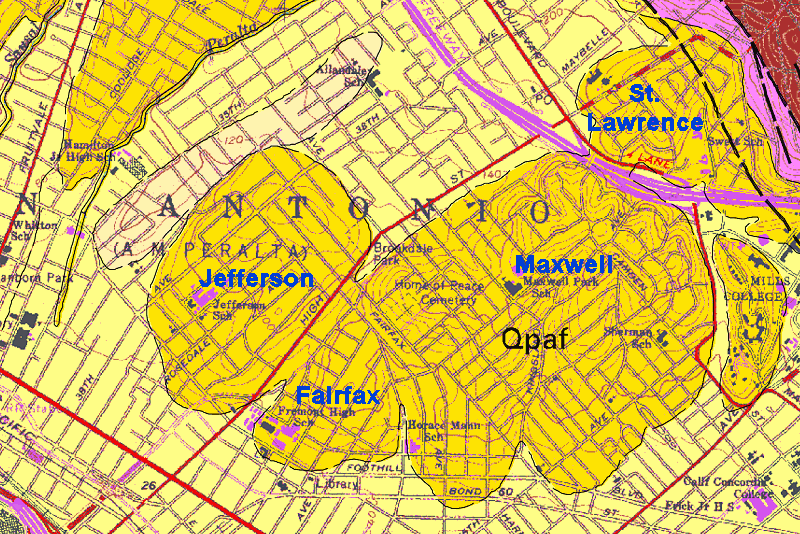 The other is where Courtland Creek cuts between the Jefferson and Maxwell segments. 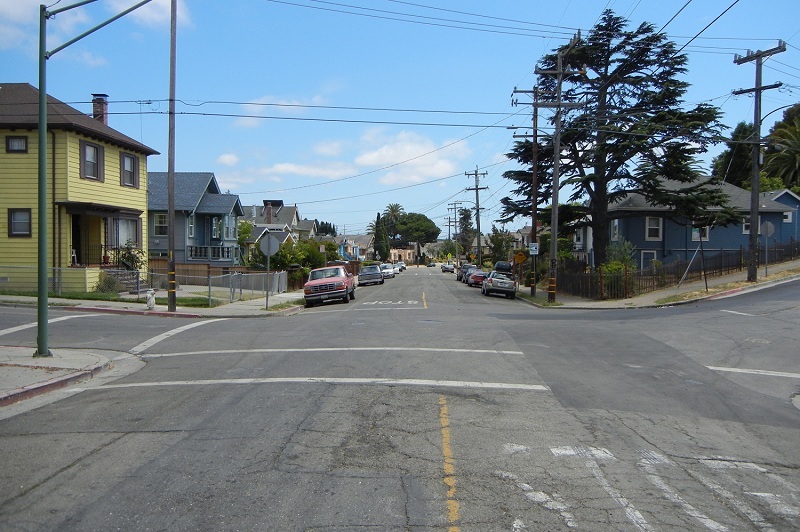 High Street took advantage of that gap in East Oakland’s earliest days, probably following an older footpath. 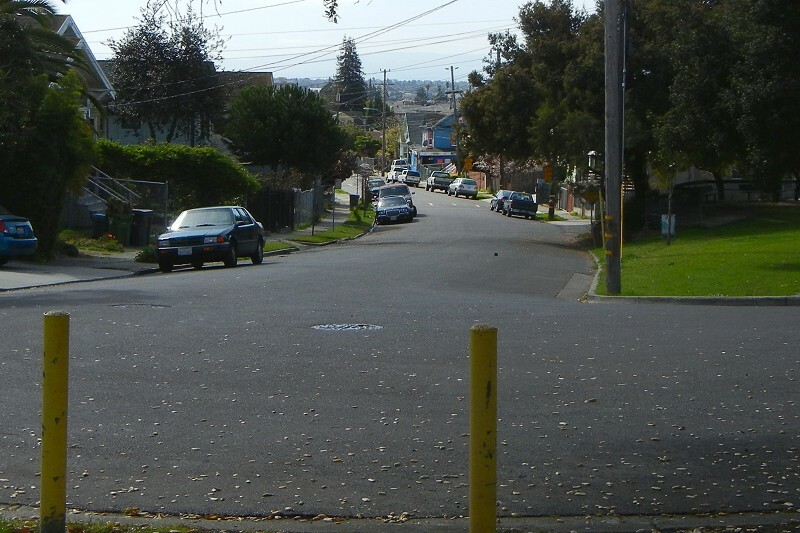 The gap carved by the creek is visible in this view west down Maybelle Avenue. 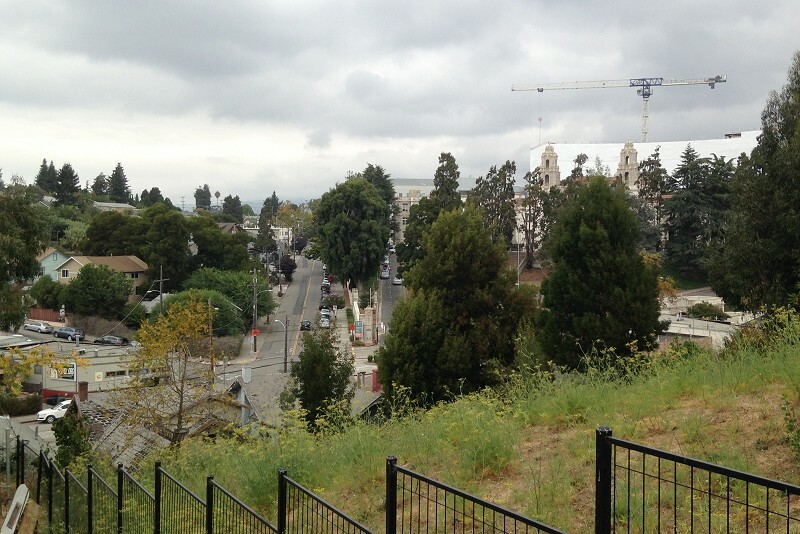 The church at the left edge is St. Lawrence O’Toole, perched on its namesake segment above the Laurel district. 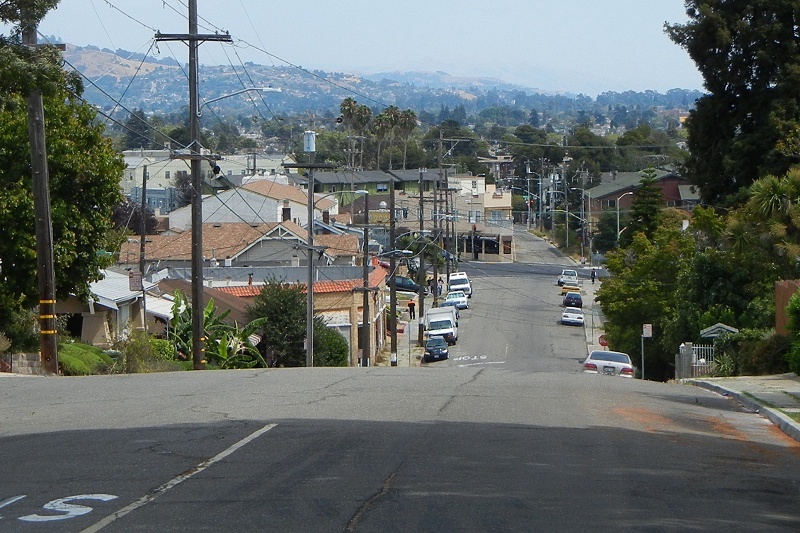 This view south from High Street shows San Carlos Avenue crossing the valley of Courtland Creek. Courtland Street runs up the creek now, built on the old Key Route right of way. Other small streams have carved valleys into Lobe 6, but today the valleys only carry culverts and add charm to the topography. 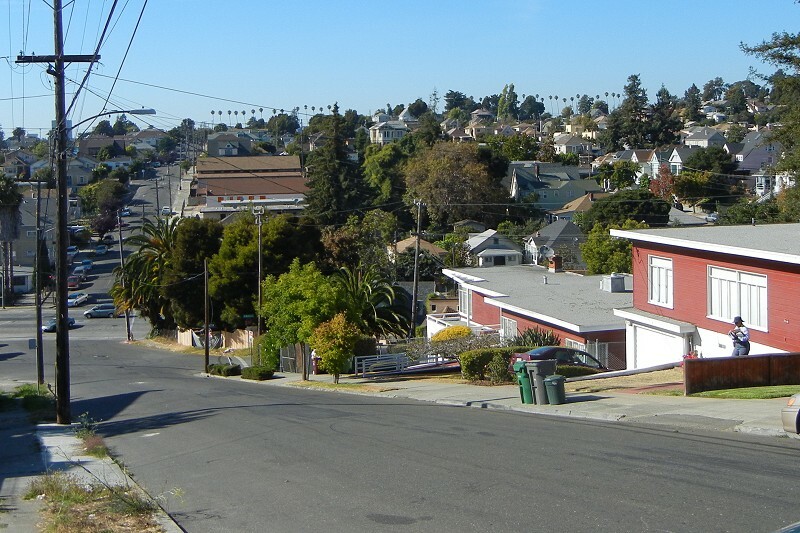 The valley of Vicksburg Avenue, separating the Fairfax and Maxwell segments, is the headwater catchment of little 54th Avenue Creek. 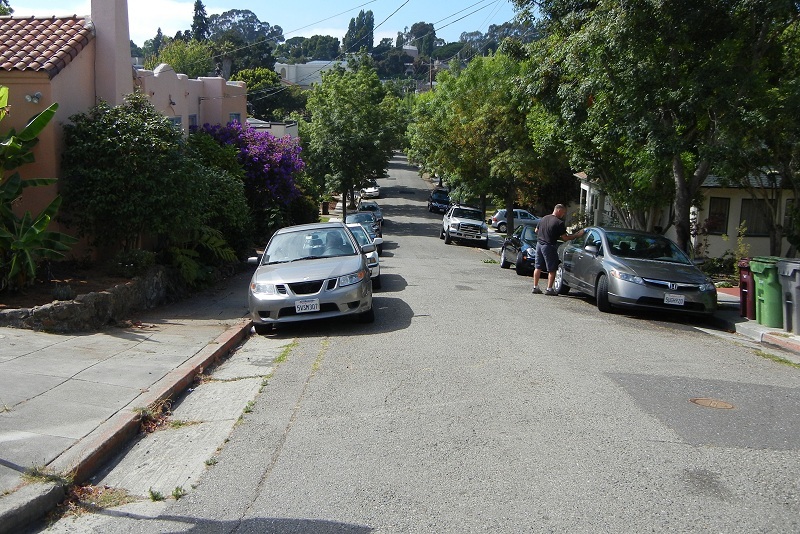 Birdsall Avenue, just to the east, also runs up a nice creek valley. These “low roads” running along the stream valleys are your best bets for a pleasure walk, since the streets of Lobe 6 were otherwise laid out in a grid without ridge roads. 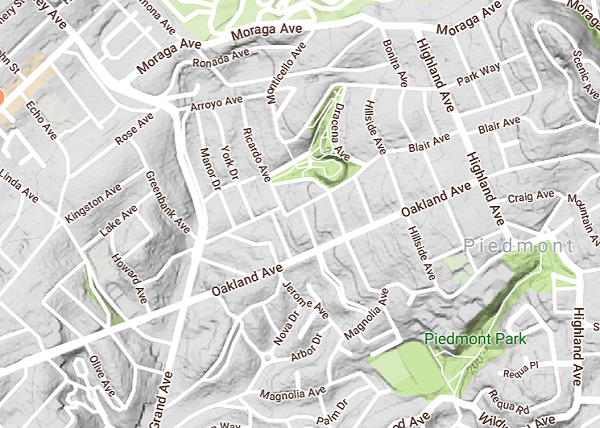 The nearest thing to a ridge road is 47th Avenue, in the small Fairfax segment. 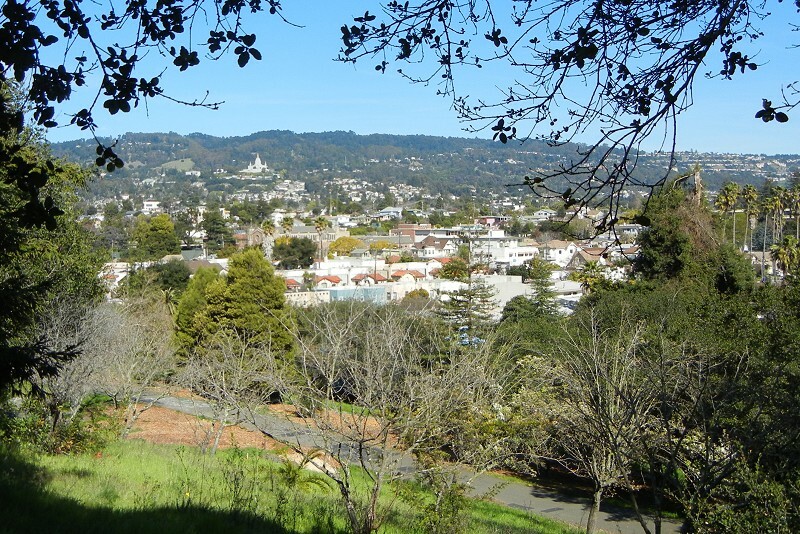 At its top it dips into Vicksburg Valley and offers this view of Home of Peace Cemetery on the Maxwell segment, a pleasant place to visit and an easy landmark to spot from the BART train. The high streets are a bit awkward to get around on, but they have lots of charming spots. 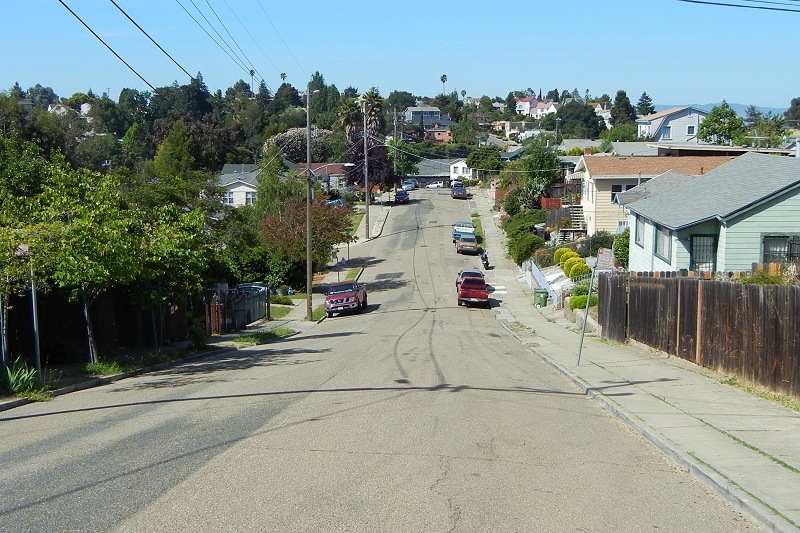 This is where Storer Avenue sweeps around the northernmost rampart of Maxwell Hill, seen from the top of the Herriott Avenue steps. 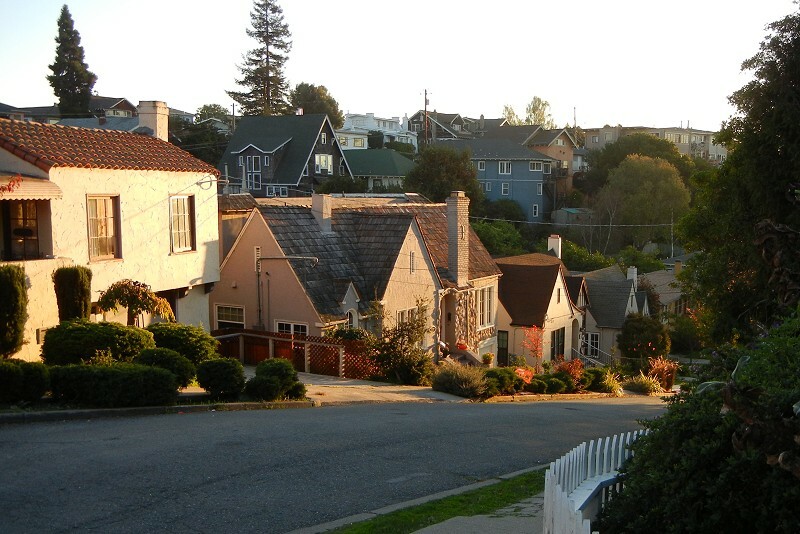 And of course there’s the postcard view of Meldon Avenue, worth seeing even when Redwood Peak and the high hills aren’t visible. I always enjoy tramping around here. Photo locations and a hint of the terrain below. In other news, I will be taking the rest of the month off. Come January, I’ll throttle back my time on this blog, posting biweekly instead of weekly. More details in the Announcements/Q&A page. 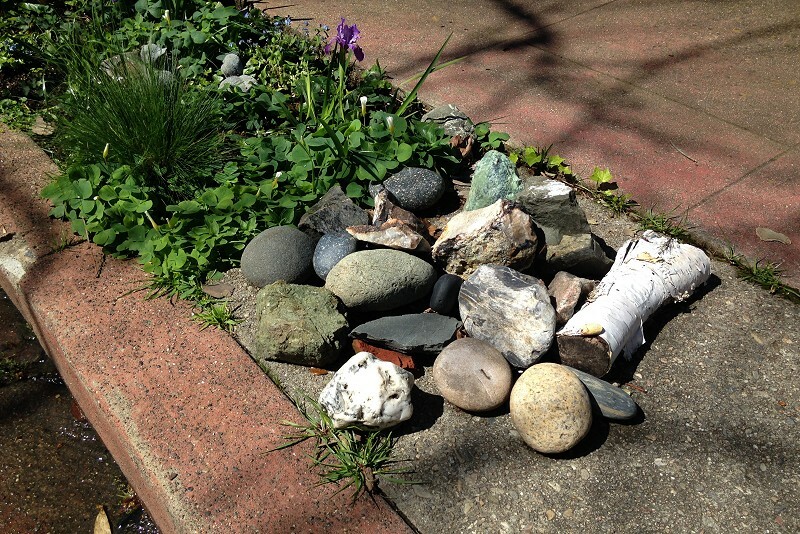 During the eight years I was surveying every sidewalk in Oakland, taking in the geology and geography as I went, I took thousands of pictures. 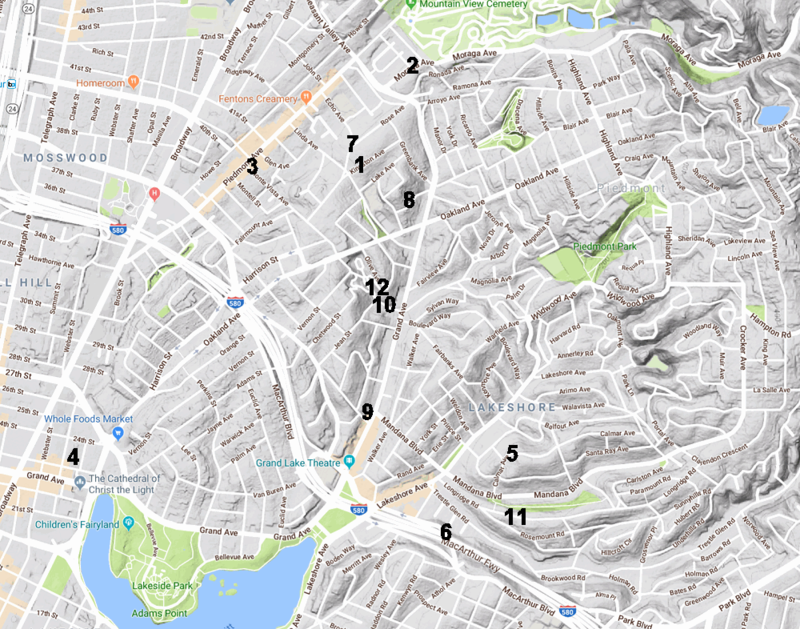 Here’s a baker’s dozen of my favorite shots from the ancient alluvial fan that dominates central Oakland, specifically the large segment I call lobe 4. 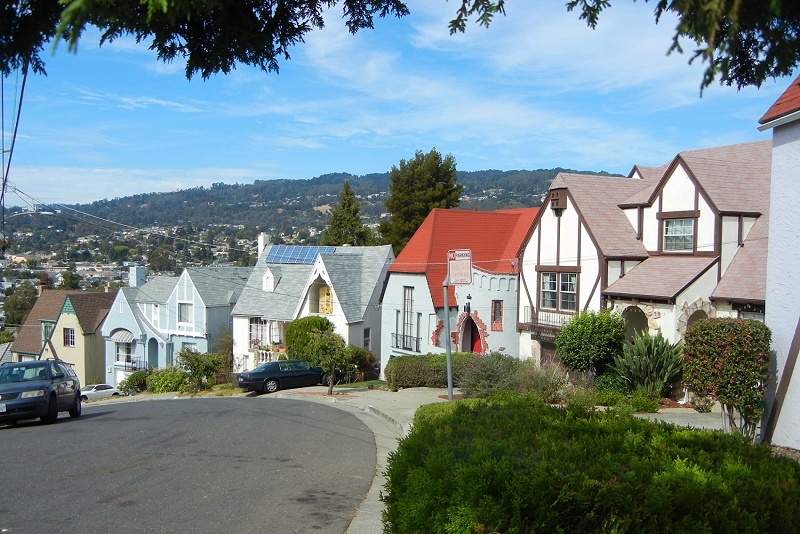 Every part of the Fan makes an interesting walk because of its rolling topography and the charm of the neighborhoods, different from block to block. 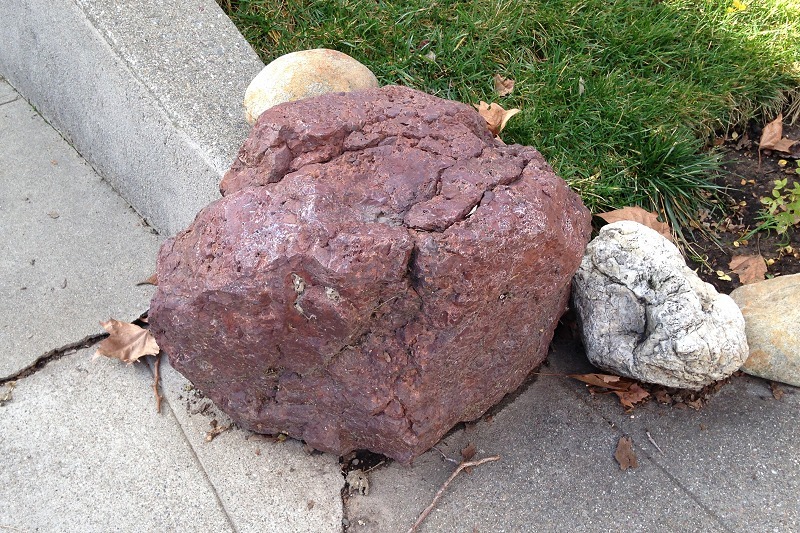 If you get any message from this love note to lobe 4, I hope it’s an urge to take lots of walks there. 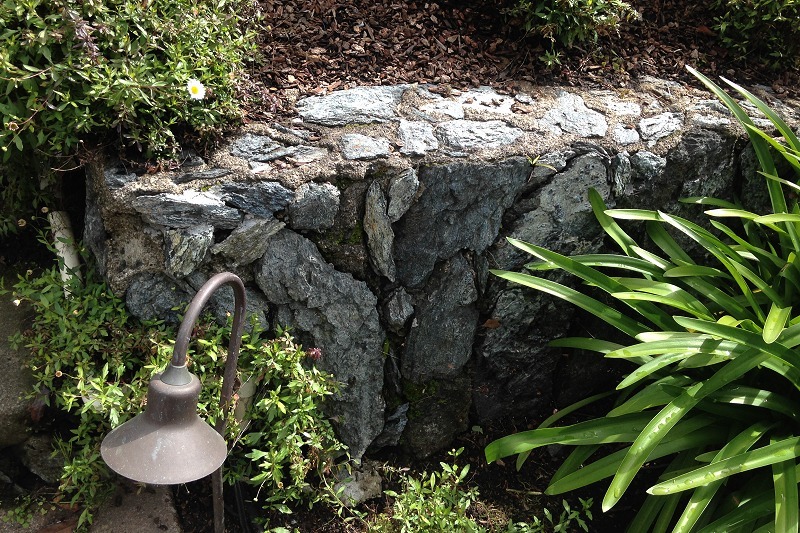 The lobes of the Fan are defined where streams have cut through it all the way across to bedrock. Whereas the four outermost lobes are simple landforms, the inner four have been sculpted within their borders as well as around them. And lobe 4, the biggest one, is full of variety at all scales. 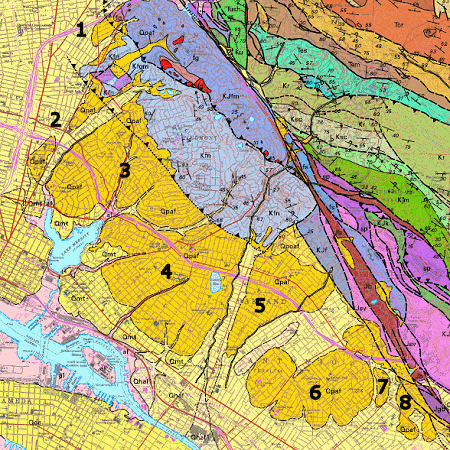 Here’s a closeup from the geologic map. 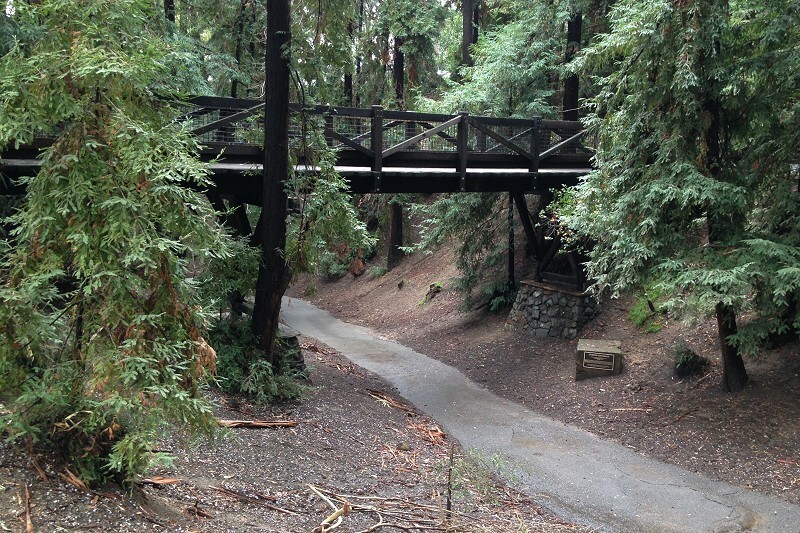 I think of lobe 4 as being divided, by two streams and a freeway, into four segments. (That would make them anthropo-geomorphic entities, I guess.) I’m giving them names for convenience, not to be confused with the names of the neighborhoods. Lobe 4, like the other lobes, has an outer edge that’s rather steep, although the elevation change hardly reaches 100 feet. Here’s the north edge of the Glenview segment, seen from below in Indian Gulch. This is looking over the edge of the Haddon segment at Lakeside Park and Adams Point Hill, in lobe 3. 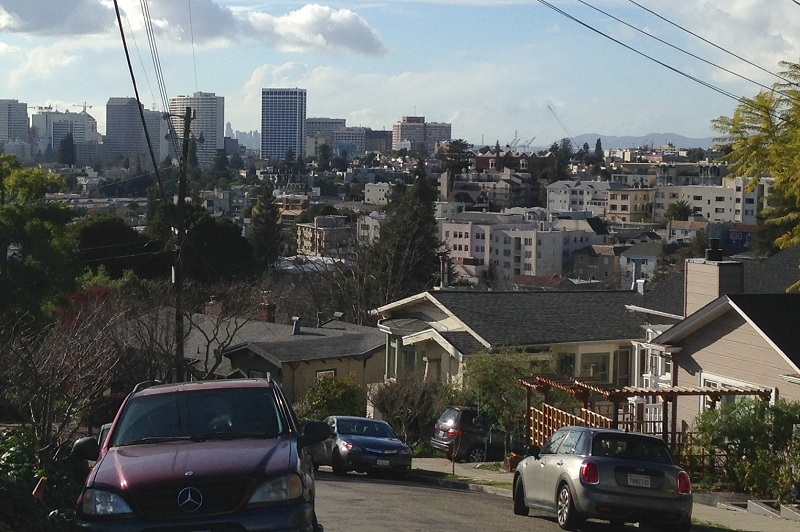 This is the view west across Alameda from the crest of the San Antonio segment, in San Antonio Park. 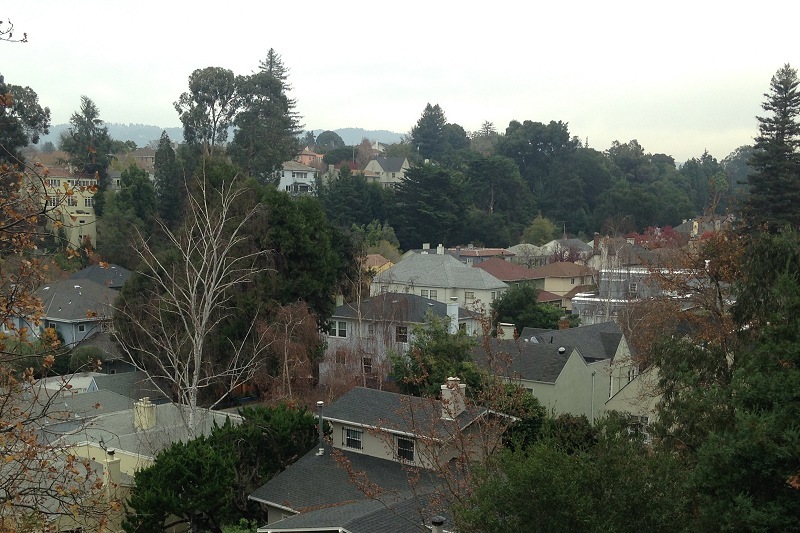 And this is looking over the valley of Sausal Creek from the east edge of the lobe. 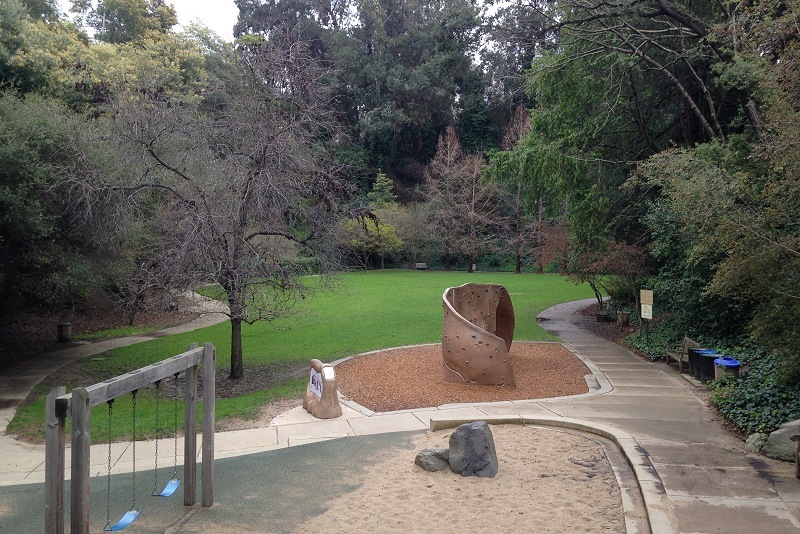 The Haddon segment is separated from the Bella Vista segment by the valley of Park Boulevard Creek. This view from Ivy Hill looks across the valley to the Haddon segment’s highest point, occupied by St. Vartans Church. 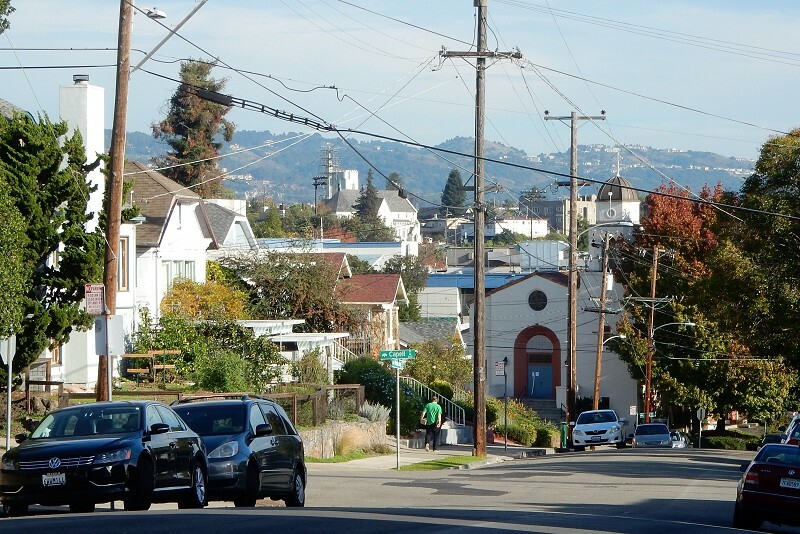 From the top of Haddon Hill you can see over Oakland High and the freeway to the Glenview segment, where St. Mary Margaret Church sits. (The chapel in the foreground houses a pre-school today.) 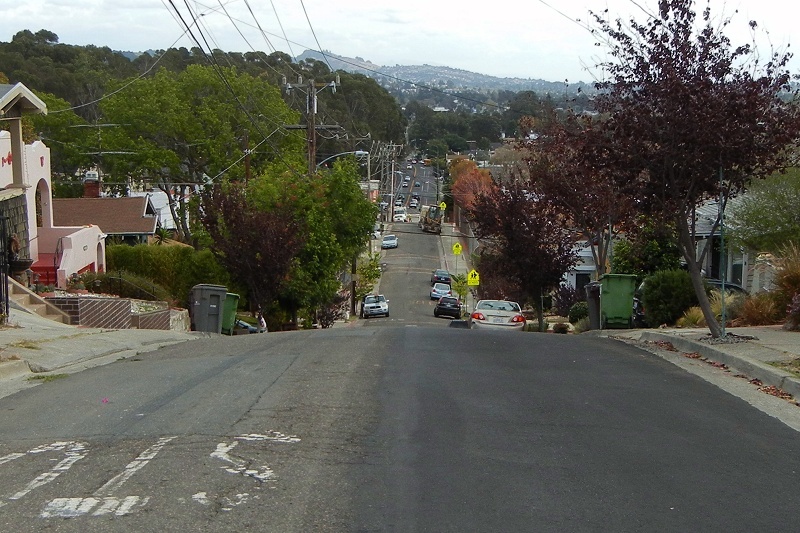 On the skyline is Sugarloaf Hill. 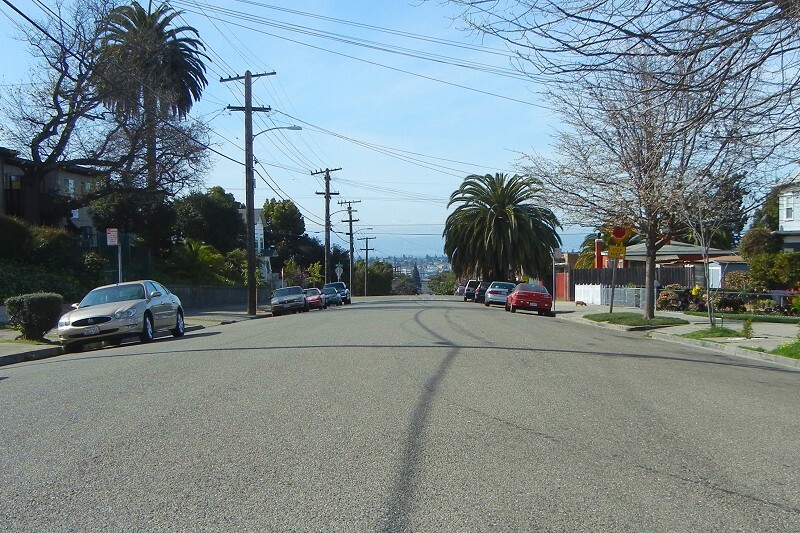 The Bella Vista segment is easy to spot from all over town, because of the allee of very tall palm trees on 9th Avenue leading to the former site of the “Borax” Smith estate. This is it as seen from the north on the Haddon segment. And this is it from the other side, looking north across the valley of 14th Avenue Creek from the San Antonio segment. 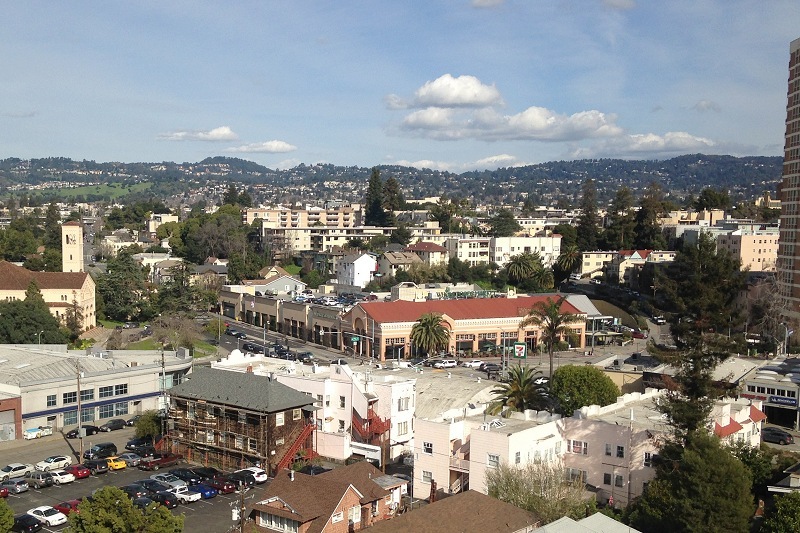 The other major highlight of the Bella Vista segment is Highland Hospital, sitting at the top of the stream valley where it was sited to catch the healthful Bay breezes and let in the beneficial sunlight. Today’s hospitals have sealed windows and filtered air. The weedy foreground is the scar of a landslide. The steepest parts of the Fan are prone to them. From the high part of the Bella Vista segment, we can look east across the valley of 14th Avenue Creek to the San Antonio segment. The creek forks here, accounting for the bump in the road covered with fresh blacktop. All three of the western segments are themselves dissected by small valleys, each segment with its own distinct pattern. 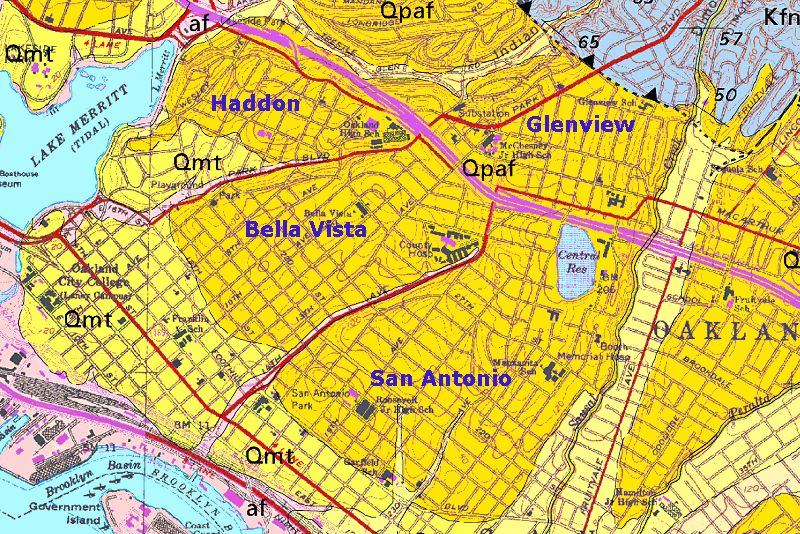 On the San Antonio segment, among other features, is the gentle valley of 23rd Avenue Creek, occupied at its mouth by Garfield School and the colorful Church of Tonga. This is looking down the valley from its unobtrusive head. Not all of lobe 4 is sloping. 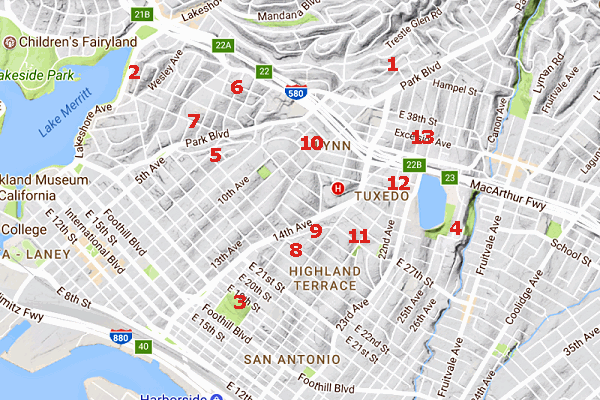 The Lynn and Tuxedo neighborhoods, on the Bella Vista and San Antonio segment respectively, are pretty flat. 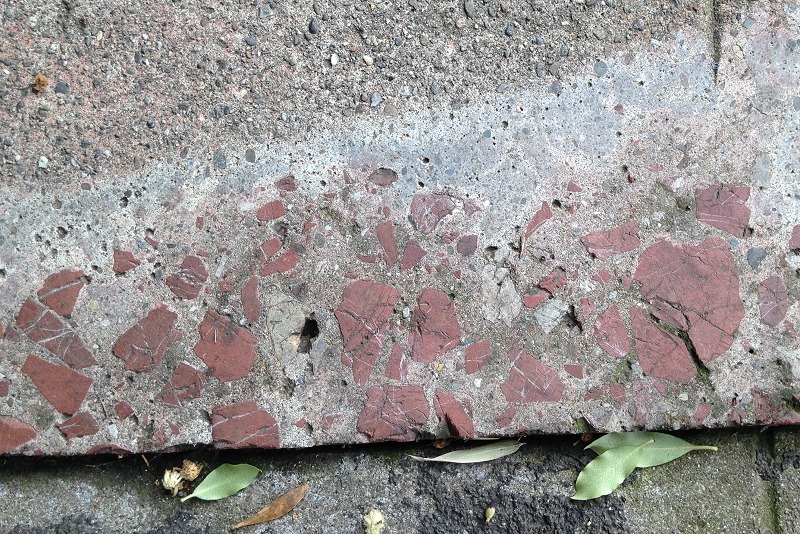 Tuxedo flat is strikingly flat, so level that I occasionally wonder if it’s a wave-cut terrace. But it’s probably just undissected. The heart of the Glenview segment is rather flat, too. 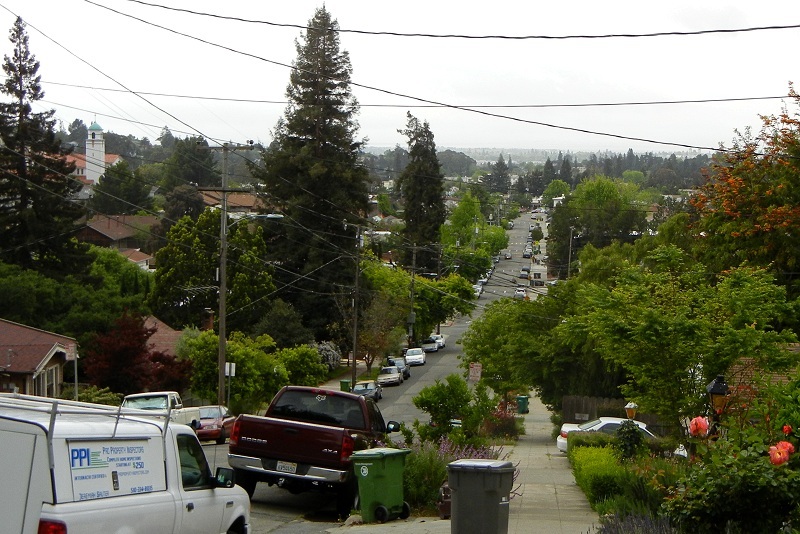 This is looking east on Excelsior Avenue toward the rise at the back side of the Altenheim, which overlooks the Dimond district in the valley of Sausal Creek. 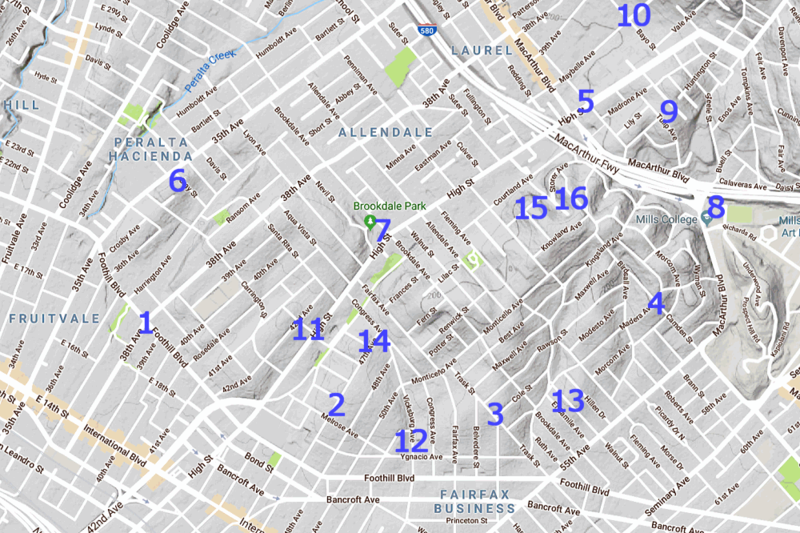 To help you with all those locations, here’s a key to the 13 photos. I hope this inspires you to get out on the Fan. Maybe I’ll see you there.